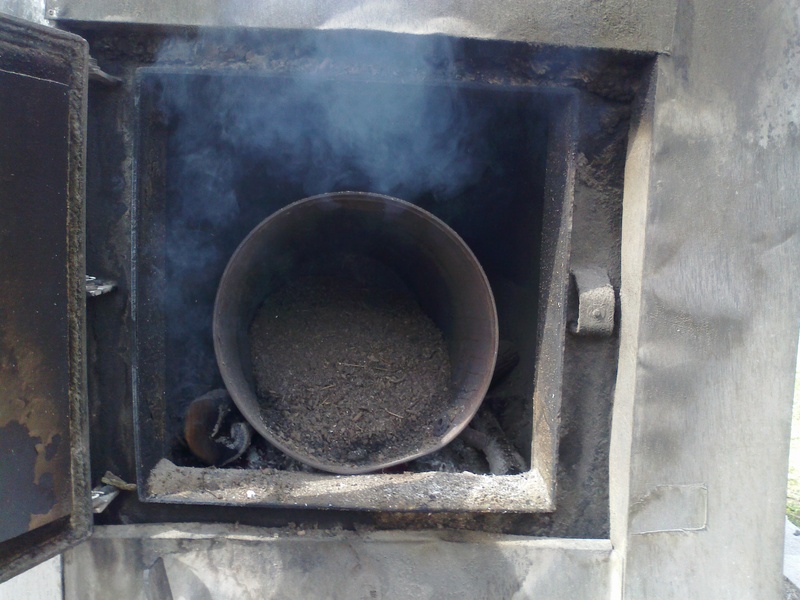 I use our outdoor wood furnace to cook our compost. I have a few barrels around that were once used for drinking water for the military. I set the barrel on the wood fire and fill it about a third of the way full with moist compost. I use a shovel to keep it stirred, kind of like soup. If I don’t keep it stirred, it will burn, and burnt compost is not very good to use. After it has reached a temp of 180 degrees, I take it out and let it cool. It is a sort of pasteurization. The soil that comes out is nearly sterile. I pasteurize my compost just for germinating seeds. I use compost all over my farm for other purposes, and I don’t bother to heat it. Some times, weed seeds can blow onto or get into the compost and they love it. The heat seems to stop most unwanted seeds’ viability. If any plant pathogens are present in the compost, they are taken care of during the sterilization process. Some seedlings are particularly susceptible to soil pathogens and this results in damping off. Damping off is a term used to describe seeds that do not germinate, or seedlings that suddenly die before they get their true leaves. There are other conditions that contribute to damping off such as cool or cold soil temperatures, and too much moisture, but there are also tiny little monsters existing that cause damping off as well. Some of the pathogens which I am referring are botrytis, pythium, fusarium, and rhizoctonia solani. While I don’t know if my compost contains these pathogens, I’d rather not find out the hard way. Usually, with transplants, signs show up in time to take care of the affected plants. With seeds, I may never see them germinate without this vital precaution. I use cooked compost to mix into my seed starting medium. I think this practice has been around a while. The very first nursery that I worked at cooked soil for seeds, that was back in 1992. Before then, I had experienced strange events where I would start seeds that died just after they popped up. Not often, but sometimes it would just happen, and I didn’t know why. Just recently, I have seen machines that steam your planting medium. They sell for about $1700.00. I have considered purchasing one of these, but it’s not quite that high on my priority list, or my budget:) Besides, there’s nothing like a good cookout!